Under the rule of Hafez al-Assad, Syria has achieved economic progress which benefited a larger majority, exercised foreign policy independence even from its ally Russia, and did not seek to unite the Arab world against Israel. 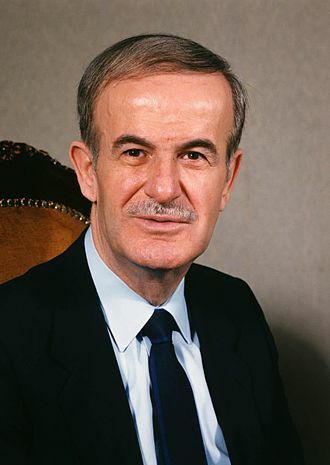 To secure his position, Hafez al-Assad, populated the top echelons of the military and intelligence agencies with Alawites, while the civilian institutions were assigned to the Sunnis. His own Vice President, Abdul Halim Khaddam, is a Sunni Muslim of middle class origin. After the death of his father on June 10, 2000, Bashar Al-Assad was elected president by an unopposed ballot on 10 July 2000. Syria is still a secular state. 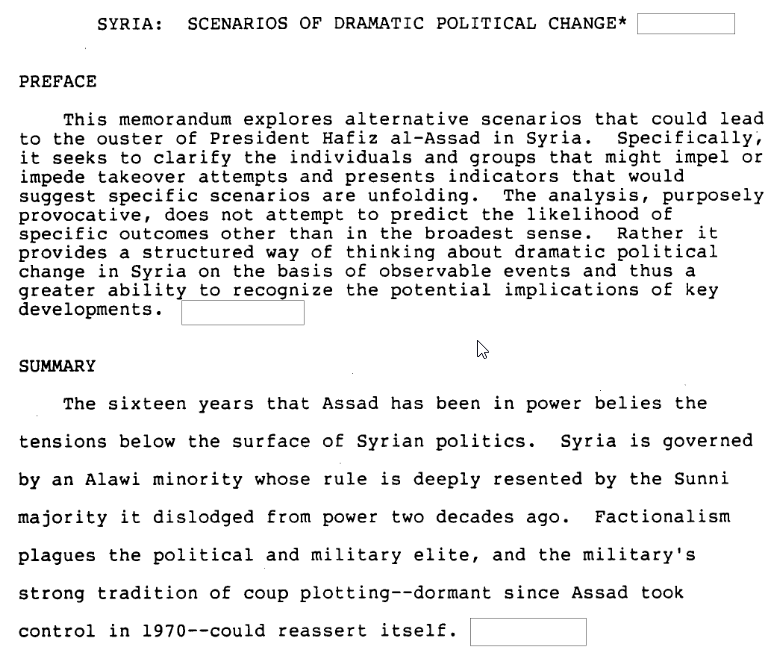 Back in 1986, the CIA played out different scenarios on how to exploit the Sunni and Alawite divide, preferably wanting to put in power a Sunni. Below, we can see how the Sunni Vice President, Abdul Halim Khaddam, is being “honored” by the mighty presence of the old guards of the Deep State, i.e. 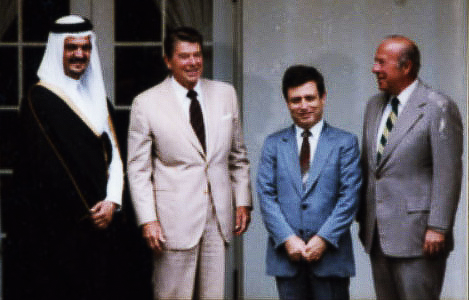 Ronald Reagan, George Shultz, and their counterpart in the House of Saud, Prince Saud al Faisal. Notice how George Shultz looked at Reagan with a victorious smile. As an aside, George Shultz also spearheaded the toppling of the Philippine dictator Ferdinand E. Marcos, at just about the same time the document was penned in 1986. As to why Hafez al-Assad survived through the tumultuous 80s and 90s, and not Marcos, can only be explained by the strong presence of the Jesuits in the Philippines. It has been proven, time and again, that whenever the strongman is weakened physically, various interest groups would then start repositioning themselves for their own advantage. This will hasten significantly any outsider’s plan for a regime change. We judge that the most likely scenario of dramatic change in Syria is a power struggle over succession… tensions between Alawis and Sunnis have been muted in recent years, but the potential for serious communal violence remains. In hindsight, this CIA projection has been rendered moot when the Syrian population saw the outcome of NATO’s “no fly zone” in Libya and “Operation Iraqi Freedom” to destroy Saddam’s imaginary WMD. … by using legitimate opposition groups, and outsiders like Daesh and the frequently rebranded Al Qaeda. Those groups who are claiming to be the legitimate opposition are now talking with the Syrian government under the untiring efforts of the Russia-led coalition. However, the Deep State minions at the US State Department have continued throwing in the proverbial spanner in all of these peace efforts, which incidentally is also part of the scenario being played out decades ago. The continuation of Alawi dominance would be most beneficial to Soviet interests. The value of an Alawi regime to Moscow would diminish, however, if the new government fell victim to political infighting, forcing the Soviets to choose sides in a series of power struggles. That’s what the CIA was hoping upon Hafez al-Assad’s eventual passing. Expectedly for the former military general Hafez al-Assad, who rose to power through a series of military exploits, he did manage to prepare his heir apparent, Bashar Al-Assad, for the job, so very well indeed. Parallel to his military career, Bashar was engaged in public affairs. He was granted wide powers and became head of the bureau to receive complaints and appeals of citizens, and led a campaign against corruption. As a result of his campaign against corruption, Bashar was able to remove his potential rivals for president. In 1998, Bashar took charge of Syria’s Lebanon file, which had since the 1970s been handled by Vice President Abdul Halim Khaddam, one of the few Sunni officials in the Assad regime, who had until then been a potential contender for president. We can already see how the CIA has been outmaneuvered early on by the House of Assad, and that’s gravely unacceptable for the Deep State, whose Greater Israel project must be realized now that The Donald has capitulated to their ranks, in such a very short time! They could not wait until Syria will be able to exploit is newly discovered natural gas deposits which could propel the secular country to economic prosperity, a scenario that is even harder to manipulate and influence. Here’s the actual CIA document released by the agency through its CREST database. Strikingly, the above document itself was prepared by the [xxxx] Foreign Subversion and Instability Center, Office of Global Issues. Just in case you’re still wondering, why the hell would the CIA released such a revealing information to the public? The only sensible answer would be that the agency can always trust the public to do NOTHING.